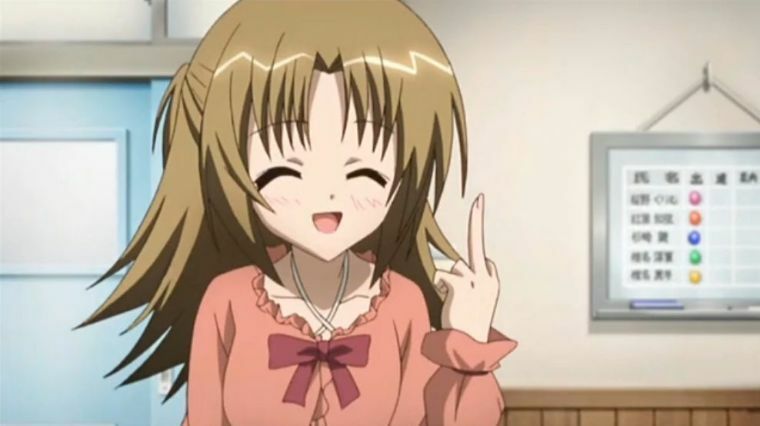 Once in a while, an anime character will break the fourth wall and address the viewers. 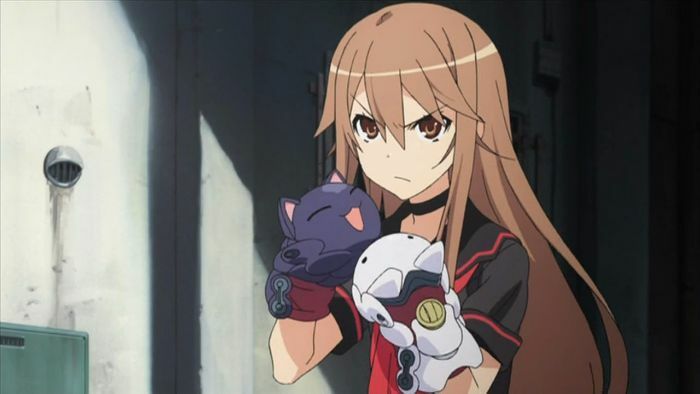 In some anime, the characters mention their voice actors, or point out how meaningless a cameo is. This fourth wall breaking usually happens in moderation, and then the anime resumes its regularly scheduled normalcy. Some anime, though, never know when to stop. They don't so much break the fourth wall, as prevent it from existing in the first place. In series like that, the characters are often aware they're characters in an anime, and play with this idea -- with hilarious results. The anime below show what happens when a series becomes self-aware. Hidenori: "It's cause I heard Square Enix and Sunrise are doing a collab." Tadakuni: "This is an anime about normal everyday life!" In the first 15 minutes of this anime, the series alludes to a trope, sets up a story, abruptly ends said story, then has the characters reference the anime creators by name. From there, it snowballs into a slice of life anime that completely destroys your expectations of slice of life anime. The characters point out tropes and twist the life out of them with ridiculous yet clever humor. They question their right to have an anime based on them, announce their "lazy sponsors," and generally keep reminding the viewers that you're watching a parody that's quite aware of its own silliness. Great Will of the Macrocosm: "Wake up, Excel. Excel, you must not die the moment the show starts. Life is valuable, but more than that, consider the storyline." Excel Saga hits the ground running, and trips haphazardly over its own feet through the entire series. 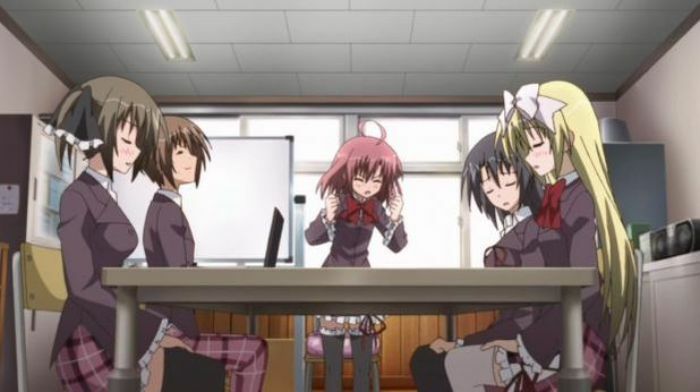 The characters themselves acknowledge that it's an "experimental anime." Each episode has a different feel to it, but one thing remains the same: ridiculous, slapstick comedy that messes with continuity, constantly makes and breaks its own rules, and features the most lovably annoying main character. 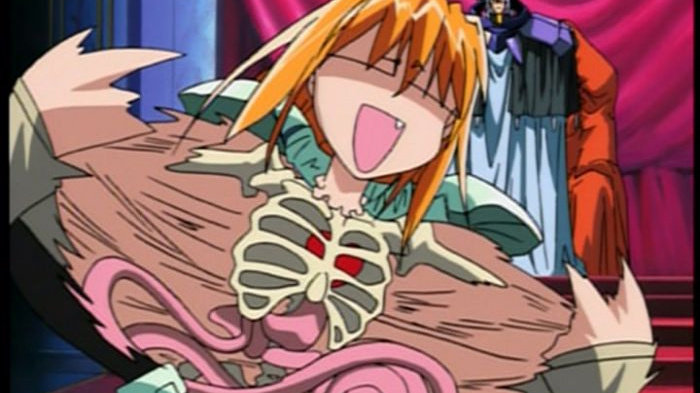 When Excel is almost killed off in the first episode, she is told that the anime can't go on without her. When she's sent on assassination order to kill her own mangaka and creator, her very existence is questioned. Watch as the series scoffs at conventional anime and creates something that lives in an entirely wall-less universe. Poemy's mother: "Why does Poemy refer to herself as Kobayashi?" Nabeshin: "She's bad at staying in character." Puni Puni Poemii is a spin-off of Excel Saga, so you know to expect the same kind of insanity. The short 2-part OVA is even more aware of itself, constantly making ridiculous references to real-life things that the characters in the anime universe have no business knowing. Poemi insists on referring to herself by the name of her voice actress, and calling her father Nabeshin "The Director" (since the character is voices by the series director). There's no end to the shenanigans as the series turns the magical girl genre upside down, then shakes it a bit for good measure. Tetora: "You should just read this manga as is. Why would anyone want to make an anime adaption?" 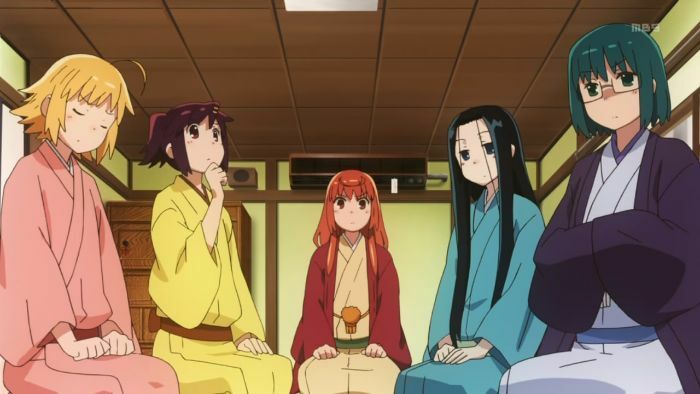 This anime features five girls who perform rakugo (a form of Japanese theater where a lone performer sits on stage and entertains the audience with stories). The girls are not only performing to an audience in their world, they're also performing for the audience beyond the screen. The episodes mostly consist of the five girls sitting around and talking -- and making lots of cultural references, as the creator is also the mind behind the culture-stuffed Sayonara Zetsubou Sensei. 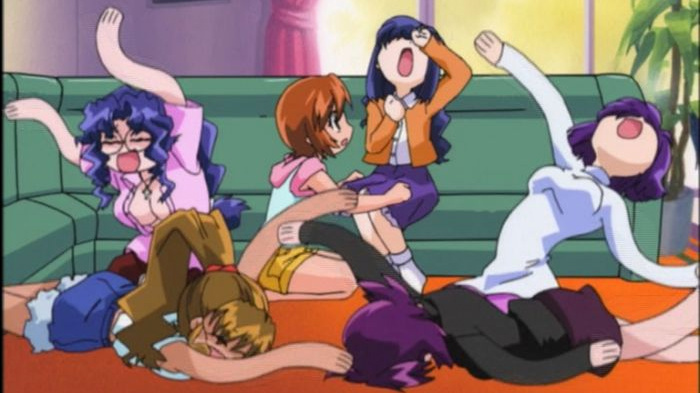 But the girls are perfectly aware that they're entertaining you, the viewer, and are happy to talk about the audience, comment on various aspects of their own anime, and generally pretend you're one of them. 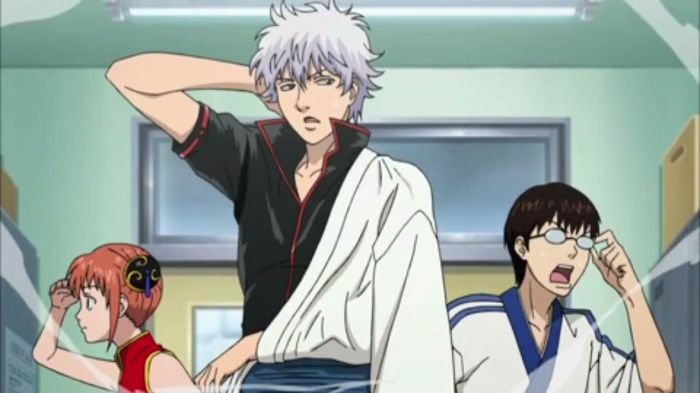 Gintoki: "What is this!? Somehow I've become a simple sketch!" 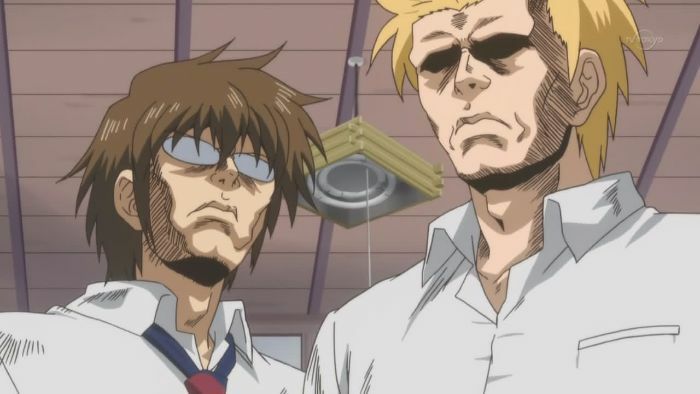 Shinpachi: "Oh, looks like even the key animation isn't done on time and all we have are the rough drafts." Gintama isn't always self-aware, but nearly every episode contains some gag of the self-aware kind. Whether the team is complaining about lazy animators, or literally turning into unfinished sketch outlines, the series is full of this kind of ridiculous humor. Maybe its ability to laugh at itself is what has made it so popular among its many fans. Kurimu: "We don't need unnecessary character settings!" Ken: "But I am the main character, you know." On the surface, Saitokai no Ichizon is a harem anime. In reality, it's full of a different kind of fanservice: references to video games and other anime. The characters are not entirely aware that they're in an anime, but they break the fourth wall consistently enough to make this one nearly self-aware anime. Narrator: "Oh, that's my cue." 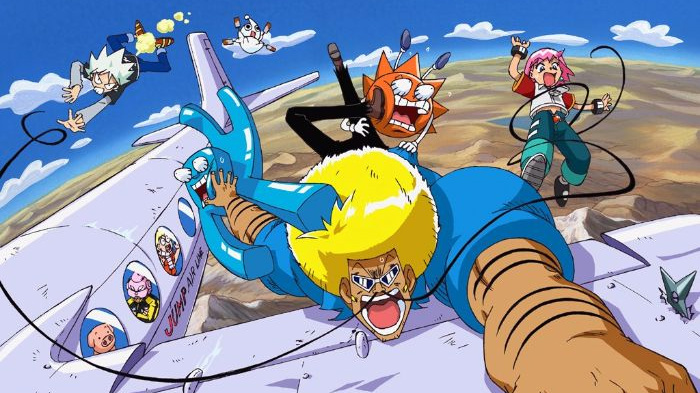 Bobobo breaks many tropes and is an insane series from start to finish, which means it's not afraid to do things differently. Amid the craziness, you'll find the narrator nearly missing his lines, characters becoming aware of the character title cards written on screen, and other similar silliness. Narrator: But really, what a pitiful chest, even though this is a service scene. This series plays it straight for the most part, and exists comfortably in its own world… except in one case: the characters can hear the narrator. Besides the bulk of the action which plays out like an otherwise relatively normal anime, the characters occasionally stop what they're doing to respond to or glare at the (nonexistent) narrator. The narrator loves commenting on the events of the series, as though she's watching along with the viewers (she also loves commenting on the girls' chest sizes..! ).